Dr. Apeksha L Dupargude Randhire is a trusted Cosmetic/Plastic Surgeon in Nande, Pune. You can consult Dr. Apeksha L Dupargude Randhire at Dr. Apeksha's Skin Clinic in Nande, Pune. Don’t wait in a queue, book an instant appointment online with Dr. Apeksha L Dupargude Randhire on Lybrate.com. 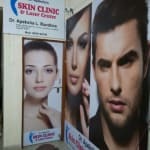 Lybrate.com has a nexus of the most experienced Cosmetic/Plastic Surgeons in India. You will find Cosmetic/Plastic Surgeons with more than 29 years of experience on Lybrate.com. Find the best Cosmetic/Plastic Surgeons online in Pune. View the profile of medical specialists and their reviews from other patients to make an informed decision.